I acknowledge this box is built-to-order so shipping could be delayed up to 5 weeks and agree with the Terms & Conditions set forth within the corresponding tab below. With the help of an Owens Dog Box, taking your dog on the road with you will become a breeze! 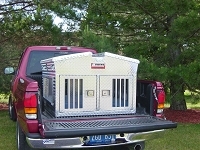 Owens Products offers a wide variety of dog boxes with storage. These dog boxes are produced for the professional K-9 handler to the Do-It-Yourself customer and covering all types in between. Owens dog boxes are built with rugged diamond tread aluminum which will withstand repeated heavy use and last for years to come. Transport your dog in safety and style with an Owens Dog Box, it will be the first and last dog box you will ever need to buy! For a limited time, get a FREE pair of rubber floor mats with the purchase of this dog box! See the "Promotions" tab for further details! 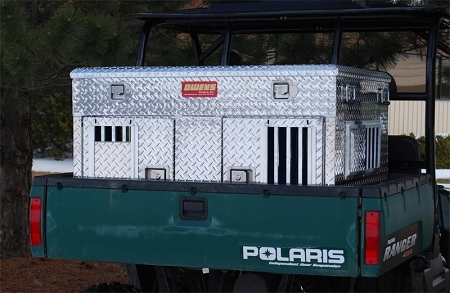 This Hunter Series Double Kennel Dog UTV Box is ideal for the hunter needing to travel with two dogs in a utility vehical (UTV). Not only can you transport your dogs right into the field with you, but the convenient built-in top storage compartment can be used for storing all of your hunting and training supplies as well. This box fits in the Polaris Ranger - take it right in the field with you! ** Don't forget to add any accessories you might want for your dog box, such as rain awnings, storage trays, cooling fans, rubber mats and more! Just click the checkbox next to each of the accessories you want to add within the Optional Add-ons section above. The cost of the accessory will be included in your dog box price automatically. By adding your accessories now, you won't pay any extra shipping and we'll even give you a discount off our normal retail price of these same items found elsewhere in our store. All dog boxes are built-to-order at the manufacturer in Michigan and are shipped from there. For orders placed March through August, allow up to 3 weeks build time before shipment. For orders placed September through February, allow up to 5 weeks build time before shipment. Allow 2-5 days in transit after shipment. We will determine which shipping carrier to use based on shipping costs to your delivery location. You will be notified of the carrier and tracking number upon shipment. Shipments to commercially zoned delivery addresses are priced based on delivery state as provided in the Shipping Zone drop down option. Shipments to residentially zoned delivery addresses incur an additional charge. Shipments to residentially zoned delivery addresses which were misrepresented on the original order as a Ship To Location of "commercial" will be assessed the additional residential delivery fee as a rebilled charge to the original payment method at the time of shipment. Misrepresentation of your Ship To Location may delay your order and potential ship date. Orders for dog boxes are put into production build within 48 hours of receiving, therefore, changes or add-ons will not be allowed after 48 hours of original order receipt. Orders for dog boxes can be canceled up until the dog box ships, however Owens Products assesses a 25% restocking fee for cancellations. This amount will be deducted from your refund. Once shipped, dog boxes cannot be returned. Point out the damage to the delivery driver so he can note damages on the bill of lading. REFUSE the shipment (it will be returned to the manufacturer at no additional cost). Take photos of the damage. Contact us immediately so that we can begin filing a damage claim and entering a replacement order for you with the manufacturer. Please include photos of the damage with your correspondence. If you accept the shipment and sign for it, that means you are stating that the item was received in an acceptable condition and releases the carrier from any liability. This makes it almost impossible for us to go back to the carrier for reimbursement after the shipment has been accepted and received. It is YOUR responsibility to inspect your shipment and we cannot be held responsible if you sign for and receive a shipment that was damaged in transit. For a limited time, get a FREE pair of rubber floor mats for the dog compartments with the purchase of this dog box! No coupon necessary. The free mats will automatically appear in your shopping cart as a separate line item when this dog box has been added to your cart. Rubber mat size will be ordered to fit your box and will be shipped along with it for no additional charge! Owens warrants all dog boxes to be free of defects in materials or workmanship for a period of one year from the date of original purchase. Download, print and return the Product Registration/Warranty Card by clicking on the PDF icon below. This warranty covers the cost of the defective part and not the cost of removal, installation, painting or other incidental or consequential charges or damages. Dog boxes are not warranted to be 100% waterproof. This warranty is void if any damage to the product is due to misuse, abuse, neglect, accident, improper installation, or any other use contrary to the instructions accompanying this product. Warranty will be pro-rated based on the length of time since purchase. All warranty returns must be issued an RMA # before they can be returned to Owens for repair, replacement or refund. Any product found to be non-defective will not be eligible for warranty repair, replacement or refund and will be offered to be returned to the customer at the customer's expense. Product will be scrapped 10 days after customer notification. Shipping damage is not considered a warranty issue (please see Terms and Conditions tab for more information on products which have been damaged in shipping). 4 Alabama, Georgia, Kansas, Maryland, Mississippi, Nebraska, North Dakota, Oklahoma, South Carolina, South Dakota, Washington D.C.
*Please find your shipping zone based on the state (or city) in which your dog box will be delivered. Then choose the correct Shipping Zone from the product options above to add the freight cost to your order. During checkout, select "Dog Boxes Only - Pre-calculated based on Shipping Zone" as your shipping option to avoid adding any additional charges to your order. Built to order, ships in 2-10 business days.